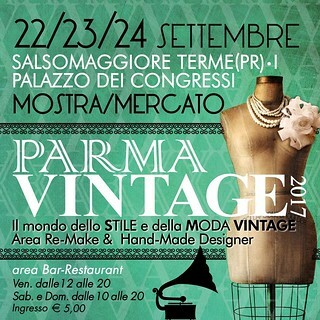 The autumn season opens in beauty with the fourth edition of Parma Vintage, the tradeshow focused on vintage fashion organised by Bi&Bi Comunicazione in collaboration with A.N.G.E.L.O. Vintage Palace. The weekend of Friday 22nd, Saturday 23rd and Sunday 24th September 2017 the stunning Palazzo dei Congressi will open its doors to public in Salsomaggiore Terme, a 20-minute drive from Parma. High quality vintage lovers and connoisseurs will have the chance to see the experts' selection of vintage clothing and accessories and luxury items as well. A.N.G.E.L.O. Vintage Palace, point of reference in this industry, will introduce as usual a customised selection of exquisite vintage clothes and accessories, bringing its touch to the chic, rétro mood of this tradeshow.